Musical Recommendations: Steven Isserlis. Grigori Sokolow. I grew up in a musical family. My father and my siblings play the violin, my mother plays the piano. I began playing the cello when I was 4 years old. The cello is a lot bigger than the violin and the strings are a lot longer. As a result, its sound is much deeper and richer. As a child I remember my siblings practicing every day for many hours. So there was music in every corner of the house. I liked the virtuosity on a violin and was jealous at some point not to be able to play the same music. However, my mother told me from a certain level it's possible to play almost every piece on the cello, which was a huge incentive. I got influenced by my family and my first CD with Mstislav Rostropovich performing the Dvorak Cello concerto! Emulating is a fundamental part of learning. When a child is taught to hold a bow, it is very often that a teacher will ask them to copy their own bow hold. After this, it is up to the child to maintain it or not! I have had the great privilege to ‘emulate’ and ‘learn’ from a number of great artists and pedagogues. This of course has shaped me as the cellist I am today. How would you describe your own development as an artist and the transition towards your own voice? I am just a messenger, a middle man between the composer and the audience. As long as the intended music is delivered, I am content. I always try to find the voice of the music and not my own voice. My relationship with my instrument is no different to the one I have with any of my friends or family. It is a sincere relationship based on mutual respect. In terms of character and personality, my instrument has a very sensitive personality, so it needs a lot of attention, love and care. Some of the qualities that I greatly admire about my instrument are the capacity it has to project, and the infinite palette of colours that it provides me. The possibilities are endless, and therefore I am always searching for new things on my instrument. One of my main concerns when starting out as an artist was to try and find my version of truth in music. There are so many ‘bench mark’ recordings and performances that are well known to the world that, it somehow became natural to rely on them for musical ideas. A great example is the ‘Elgar Cello Concerto’ and Jacqueline du Pré. To break this tradition was so difficult, but I felt that if I didn’t, I would just end up as another copy. In recent years, I have relied on the score for musical advice. I also look for letters the composers may have written during the time of composition to try and grasp the atmosphere. I have so many to be honest with you. To name two, it has to be Heifetz and Feuermann. Obviously I have only heard them on recording, but I have been fascinated by their musicianship and sound more so than their technique. Just like Itzhak Perlman said in one of his interviews, when I listen to Heifetz, it's as if a tornado just sweeps through my room. I have heard many great German orchestras live, and each and every one of them have questioned my ideas on music. These orchestras provoke me intellectually and bring the best out of my practice. My studio is basically my home. Home is where I get the most work done. I have no preferences when it comes to organizing a place for me to work. As long as my instrument, chair and stand are set up, I have nothing to worry about. Although, when I practice, I always disconnect myself from the ‘WWW’ and my phone. With more and more musicians creating than ever, what does this mean for you as an artist in terms of originality? What are some of the areas where you currently see the greatest potential for originality and who are some of the artists and communities that you find inspiring in this regard? I rely on my imagination when it comes to originality. Of course, I do everything that I can to educate myself, then I let my creativity kick in to add the narrative to the given text. I have so many people and organizations that I admire that I cannot name just one! However, I would like to mention the members of my quartet. We are a group that always strives for not only technical excellence, but both musical and academic truth. Improvising has almost died out in the classical scene. In the earlier times, cadenzas were performed by improvising on material given on the score. Nowadays, it's mostly about performing a prepared item. I have not explored improvising so much, but I have been composing more and more these days, and I hope that this part of my practice will help me branch out into the world of improvising. Recordings have always been a hotly debated subject in classical music. What are some of the quality criteria for a good recording from your perspective, what role can technology play and in which way will a recording even allow you to approach a piece from an entirely different perspective? I have dealt with so many aspects of recording that I do not wish to elaborate on the process of recording and my opinion on what makes a good or bad recording. I think that is for the public and the critics to decide. We live in such a tech savvy world and I think this has benefited the classical recording industry. We are now more capable of capturing the different colors and details that artists produce during the recording sessions. Regarding my approach to recording? Nothing has really changed. To 'converse' with the audience. To tell my story, and to hopefully influence them in a positive way. As Charles Rosen put, “the death of classical music is perhaps its oldest continuing tradition”. From your perspective, what are some of the root issues for what is generally referred to as the “crisis of classical music” and what, to you, are sensible ideas for improving it? I have never in my life thought that classical music is dying or that it's even dead. To be frank, I don't think classical music is facing a crisis also. It's an evolving form or art that is always producing new material. Just like technology, I believe classical music will also continue to grow and reach new heights. I envisage a future where every house-hold will at least have one classical music instrument, and I see it happening sooner than later! In general, the role of music is to convey truth, to influence and create change for the better in society. I pay absolutely no attention to politics in music. I believe there is no space for that. The social aspect is quite important - as we humans embody music. PR companies help musicians reach out to the world more efficiently and practically. Without them, it would be impossible to balance everything. Life on the road, practice, concerts and family keep us musicians tide up! The companies that I have worked with helped our audiences have access to our music in areas where we have not even been to. The world becomes a small musical hub thanks to them! 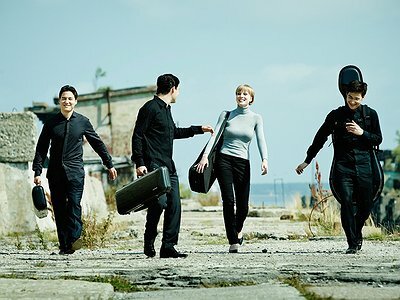 Keep up to date on the Schumann Quartet by visiting their website. "I always try to find the voice of the music and not my own voice."